Black Sabbath - "The Ten Year War"
Golden Gods Award-winning artists Black Sabbath announce "The Ten Year War" – a limited edition vinyl boxset released September 29th through BMG. A foreboding storm is gathering overhead. Bells toll, lighting cracks, rain falls… something dark and sinister is heading this way. It’s 1970 and four guys from Birmingham, with the release of their debut self-titled album, have single-handedly created what would become known forever as heavy metal. It was a singular moment of crushing heaviness that would define the genre for years to come. The sixties were over. Charles Manson and his knife wielding followers had put a violent end to peace and love and the optimism and hope of the decade had vanished. As the seventies came down like a dark cloud, Ozzy Osbourne, Tony Iommi, Bill Ward and Geezer Butler welcomed these uncertain times with open arms and riffs of thunder. And so The Ten Year War began. 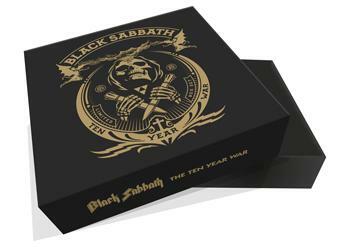 Fresh from receiving the ‘Golden God’ Icon Award at this year’s Metal Hammer Golden Gods, Black Sabbath are proud to announce ‘The Ten Year War’ – a limited edition vinyl box set, released September 29th via BMG, that brings together their eight Ozzy-fronted albums, plus a swathe of other rarities, all housed within exclusive artwork created by renowned street artist, graphic designer and activist Shepard Fairey. 8 x vinyl LPs meticulously reproduced in their original sleeves, re-mastered by renowned mastering engineer Andy Pearce from the original tapes and pressed on 180 gram splatter-coloured vinyl, each LP with unique and individual colouring. Japanese version of Evil Woman (Don’t Play Your Games With Me)/Black Sabbath. Chilean version of Paranoid/The Wizard (only 100 copies of the original radio promo were pressed). Crucifix shaped Black Sabbath USB stick, exclusive to this box set, which can be worn round the neck and contains MQA high definition audio of the first eight Black Sabbath albums. The extremely rare The Ten Year War brochure, reproduced from the original publication. Hardback book, featuring accolades from the cream of rock royalty, coupled with official and candid iconic photography of the band during their 1970s tours, recording sessions and photo-shoots. Tenth Anniversary World Tour 1978 Official Programme, impeccably reproduced. Reprinted tour poster from the 1972 Seattle Centre Arena show. Box set is individually numbered. It’s fair to say that ‘The Ten Year War’ is the definitive package from one of the most important and influential artists the UK has ever produced.